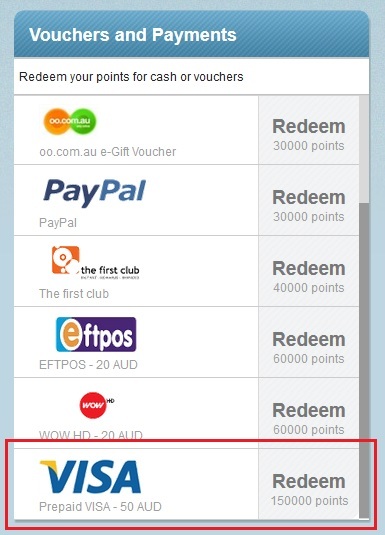 We’re pleased to announce that we have added a new reward option in the Rewards Centre. For 150,000 points, you can now get a prepaid VISA card – loaded with AUD $50 value. Prepaid VISA Cards can be used just like a credit card and are accepted at over 25 million stores worldwide or online. Cards must be activated online, and details of this will be available in your account once the redemption has been processed. There are no additional account keeping charges for card holders, and you can keep track of your balance and transactions online. If you’ve been saving your points because you’re unsure of what to use them on, why not redeem them for a prepaid VISA card? We hope you’ll enjoy this new reward option. Stay tuned, as we hope to add new and exciting rewards in the near future!